Size: 60 x 24 x 72 in inches approx. 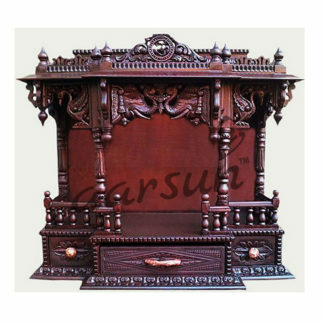 We are known as the premium designers of Wooden Temple for home which is an example of the perfect artistry of our creative artisans. 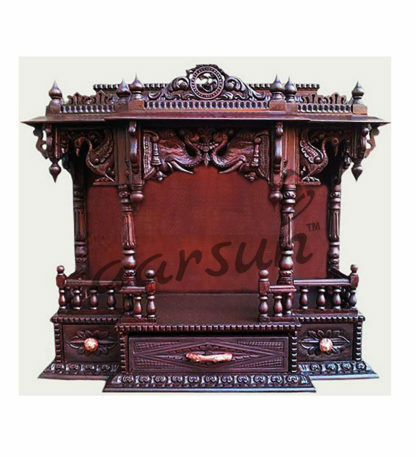 The temple is in thick base with three drawers at the front for placing some puja essentials.These drawers Are beautifully carved and there is wooden knob to open and close the drawers.Above that there is courtyard with wooden railing at the front.There are carved pillar at the sides of the temple. 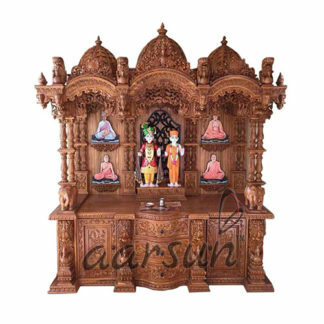 After ward there is main place of the deity where you can place your idols and there is plywood work done over at the main place of the deity.Rising to the roof there is beautiful peacocks are carved by our skilled artisans at the front of the temple and it gives very sophisticated and antique look to our puja mandir. At the roof top there is beautiful circular work done at the mehraab area with “URUSHRINGAS” at the side of the roof. 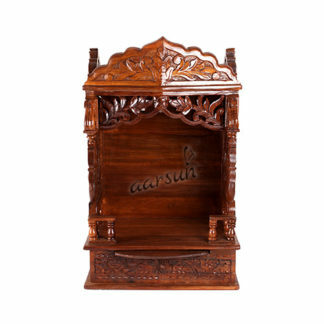 The temple is in Seasoned Teak wood with antique traditional finish and best suitable for the home and for the offices. Size: 42 x 24 x 52 in inches approx.